Steiff Country Exclusives are created to offer collectors something uniquely specific to different countries, which may depict its history, culture,customs or landscapes. These are only available in Steiff specialist shops in those countries. Over the last few years, Steiff have released several different Paddingtons, with our best selling one being launched in 2014, prior to the first film being released that Christmas. This only had a low limitation of 2000 bears and prices for it went sky high on the secondary market within the first few weeks, as there were not enough bears to meet the demand. (The RRP was £170 and prices went up to over £700!!). 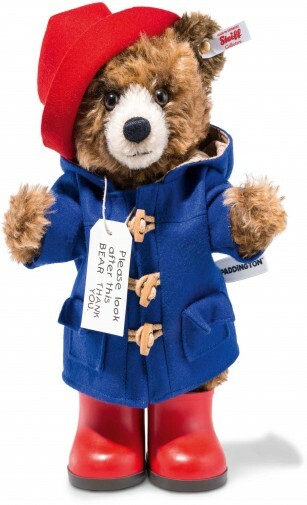 This PADDINGTON TM BEAR is no exception, as it is also limited to just 2000, so will this famous bear make collectors go crazy again and push prices up really high too?? PADDINGTON TM BEAR (Trademark Bear) has been created just before the launch of the second film, so he is a real movie star and has had BAFTA nominations. He is made from the finest chestnut mohair and wears his trademark felt duffle coat and hat. Collectors and enthusiasts will be thrilled to see that he is also wearing his famous wellington boots and he wouldn't be complete without his luggage label saying "PLEASE LOOK AFTER THIS BEAR. THANK YOU"
The first Paddington book, written by Michael Bond, was first published on 13th October 1958 and little could he have known then, that this small bear from darkest Peru would become one of the best known and loved bears by people from all over the world. If you want to add this highly collectable bear to your collection be quick, as they usually sell out very fast!!!! It has the famous gold plated "Button in Ear" and a white label, showing that it is only limited to 2000 pieces, making a very collectable bear.